An edited transcript of remarks at the December 1966 TSA meeting by Clyde S Kilby, Niekas, volume 19, 1968. 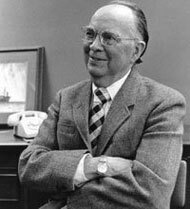 Clyde S. Kilby of Wheaton College. I might say first that there is a very small manuscript called “Mr. Bliss” that I think may now be in the hands of Raynor Unwin. There is very little text to it, but the nice thing about it is (I understand, for I have not seen the manuscript) that its illustrations are by Prof. Tolkien, himself, in color. I’ve been trying for some time to get it released to a publisher and I hope it may get into print before too long. I would first like to report that we had a session on Tolkien and C.S. Lewis at the modern language Association convention up at the Statler Hilton this afternoon. I was saying up there that so far as feature articles on Tolkien are concerned you would better take them with a grain of salt. Prof. Tolkien’s secretary, who of course is British, told me she felt lucky if she got 80% of what he was saying. He talks very fast, often with his pipe in his teeth. Also he will skip around fast as lightning. He will see a connection, but his mind works very fast and you may wait a half hour until you discover what the connection is. In other words, it is extremely easy to misunderstand. So take these feature articles with a grain of salt. Some of them are ridiculously wrong places. I have no time now to suggest which are wrong. And then I thought I might tell you something that very few people in this country know about. I went to a dramatized version of the Ring in Cheltenham England, done by 10 and 11-year-old children. It was astonishingly good. Every one of the actors and it was perfectly serious through the whole play and did a splendid job. I’m not sure what should be said about the Silmarillion. I might say that the middle story, that is, of the Second Age of middle Earth, is at present only one long and exciting story. That is, it is nothing like the length of the ring or of the Silmarillion. How much more may be written I don’t know. Prof. Tolkien is nearly 75, and he is a perfectionist in his writing. Back to the Silmarillion. I didn’t read the entire story this summer . I have no time, and indeed I don’t feel free, to tell you of its details. They could be changed — many of them — before it is published. The whole story will, Prof. Tolkien thinks, be about as long as the Ring when it is published. In 1964 he told me, by way of a very quick — sort of one sentence summary — that it was about the Creation and the Fall. That covers quite a bit of territory. And then there is the movement from Valinor, which is the original country, across to Middle-earth. You know where the Shire is on the map, and then there are the mountains to the west and to the other side of those mountains of very small margin of shoreline. This is where much of the action of the Silmarillion takes place. I couldn’t figure out, trying to work from the ring itself, the mountains and places and a whole geographical area mentioned. Well, it turns out this whole section was destroyed in a vast and bloody battle. It was such a great battle but some of the land was destroyed in the conflict. I wish I could say something optimistic about the publication of the Silmarillion. I wrote Prof. Tolkien and offered to go over there and help them, to facilitate the publication, by answering his mail or doing anything possible. (He has a vast mail which is bothersome to him, by the way, and takes up a great deal of his time.) I confess I was surprised when, on Christmas Eve a year ago , I got a letter from him which had been forwarded around, saying you’d like to have me come. Now of course the great question I hoped to help answer was, when will the Silmarillion be published? The last word I had from Prof. Tolkien, just before I left England, was that he hoped he could get one volume of it to the publisher Summer . He had told me two years ago when I saw him that it might be ready for publication in a year, and that meant it would have been out a year ago. And then, you remember, the little manner with Ace Books. He said it took nine months of his time. I think I would’ve settled the affair in an hour or two and had it off my mind, but he is not that sort and kept bothering with it. He should’ve turned it over to his lawyer and let it go at that. He says that the controversy took nine months away from the completion of the Silmarillion. Mr. Unwin told me that he’d been waiting for a brief introduction to translations of Sir Gawain and the Green Knight and the Pearl. The translations are already (though Prof. Tolkien did not really think they came quite up to his own standard) but the publisher has waited a long time for the introduction and it isn’t ready yet. He hopes to get it ready before he went with Mrs. Tolkien, in September, on a vacation in the Mediterranean, but he told me, rather sadly I felt, in early September, “I won’t get it in.” When it will be in, nobody knows. And when the Silmarillion will be out nobody knows. I wish I could tell you to be prepared for it in the next few months. But it isn’t going to be that way. But I can say that Prof. Tolkien does have plans to get back to the Silmarillion and completed. In conclusion let me tell you a little story Prof. Tolkien told me a couple of years ago. He said he received a letter from a man in London whose name was Sam Gamgee. He said he wrote back to this man saying he was glad Sam was a good character and what he really was afraid of was receiving a letter from somebody named S. Gollum!